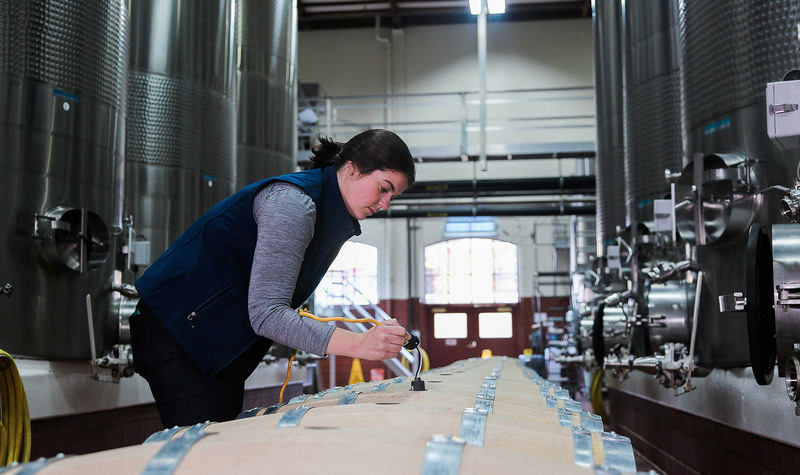 Maggie Kruse joined Jordan as enologist in 2006 before being promoted to assistant winemaker in 2009. She works closely with Winemaker Rob Davis to guide Jordan wines from grape to bottle and became associate winemaker in 2016. Born in Milwaukee in 1983, Kruse grew up in a home where wine was always on the table. Before having children, her father served as a U.S. Navy officer in the San Francisco area and fell in love with the climate and culture of the region. Frequent family vacations to Napa and Sonoma wine country peaked Kruse’s interest in a winemaking career. Fascinated by science at an early age, she also attributes her father’s work at Miller Brewing Company to influencing her curiosity for the science of fermentation. Kruse moved to Napa Valley at age 17 immediately after high school graduation, driven by her fledgling passion. She studied at Napa Valley College while waiting for acceptance into University of California, Davis. Internships were tackled between quarter semesters at UC-Davis, and her first harvest at Clos LaChance reaffirmed her belief that she was destined to make wine. At UC-Davis, Kruse also worked in the laboratory of respected sensory scientist Dr. Hildegarde Heymann—an invaluable opportunity that developed her sensory analysis skills. After graduating from UC-Davis in 2005 with a bachelor’s degree in viticulture and enology, Kruse worked for John Jordan’s sister Judy at J Vineyards & Winery in Russian River Valley, before transitioning to the laboratory at Jordan in Alexander Valley. As associate winemaker at Jordan, Kruse oversees all aspects of quality control in the laboratory and cellars, such as fermentation monitoring, tank and lot organizing, bottling, labeling and cork selection. With Davis constantly visiting the vineyards, Kruse helps to guide every wine lot through the fermentation process with daily testing at the winery. Her dedication to quality has taken her to Portugal twice to learn hands-on about cork making and to the forests of Bordeaux to study barrel crafting. “I am constantly amazed how Rob can remember each and every harvest in vivid detail,” Kruse says of her mentor. “He has an answer for everything, and it’s so exciting to learn from someone everyday with his extensive knowledge and experience.” Kruse’s favorite part of her job is tasting wines, watching each lot develop over the course of its life from vine to bottle. She resides in Windsor, Calif., with her husband and daughter. When a rare slow time occurs for the winemaking team, she enjoys traveling and playing golf.